Automotive Technology 5 Edition NOTE: You are purchasing a standalone product; MyAutomotiveLab does not come packaged with this content. If you would like to purchase both the physical text and MyAutomotiveLab search for ISBN-10: 0134009088 / ISBN-13: 9780134009087. That package includes ISBN-10: 0133994619 / ISBN-13: 9780133994612 and ISBN-10: 0133995542/ISBN-13: 9780133995541. MyAutomotiveLab should only be purchased when required by an instructor. This title is intended for courses in Automotive Principles, Service, and/or Mechanics in technical trade schools and high schools. It also serves as an additional resource to prep for ASE certification, and as a useful reference for practicing professionals. 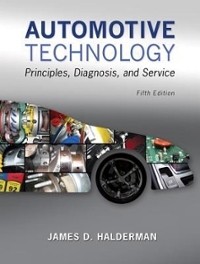 Prepare tomorrow’s automotive professionals for success Automotive Technology: Principles, Diagnosis, and Service, Fifth Edition covers all eight areas of automotive service, showing readers how automotive systems are connected, as well as the practical skills that students must master to be successful in the industry. Topics are divided into short chapters, which makes it easier to assign, learn, and master the content. Formatted to appeal to today's technical trade students, Halderman uses helpful tips and visuals to bring concepts to life and guide students through the procedures they'll use on the job. To keep your course current, all of the content is correlated to the latest NATEF tasks and ASE areas, and information on hot topics like electric and hybrid vehicles is included. Also available with MyAutomotiveLab This title is also available with MyAutomotiveLab–an online homework, tutorial, and assessment program designed to work with Automotive Technology to engage students and improve results. We’ve improved MyAutomotiveLab to better reflect the way instructors teach today. Now organized by ASE area, the new, easier-to-use design makes creating and personalizing assignments more intuitive and includes a new assignment calendar, which helps you document your students' progress.